97 William Gibb was 25 years old, a plumber by trade, and was born in 1889 in Timaru, the Canterbury region of New Zealand. His parents were David Duke Gibb & Jane (nee Deavoll) Gibb. William was also the breadwinner in the family, his father had passed away leaving William supporting his widowed mother and his two sisters Edith and Annie. By 1914 just before the war, William was living with his mother and his sisters had left the family home. William was plagued by a number of health issues throughout the early years of the war…… At Gallipoli he had a rough trot with fever and influenza, and then in France scabies, rheumatism, debility and dental problems. William would later prove that these illnesses were just minor set backs to what he would later achieve as a soldier. William Gibb would become one of the most highly decorated of the “original” sappers. Gallipoli and then in France his health problems continued until November 1917 when he went to engineer cadet school in England and qualified for a commission and was appointed 2nd Lieut. and joined the 15th Field Company Engineers. In September 1917 for his coolness and gallantry William was recommended for the Distinguished Conduct Medal but was awarded the Military Medal. William Gibb was taken on strength and marched into Rouelles and the front line on the 17th April 1918 and is now about to make a huge impact in the AIF war effort and appear to revel in the danger and defy certain death on the western front. At the Battle of Hamel on 4-5 July 1918, Gibb commanded a section of sixty engineer troops who constructed a sap forward under heavy fire near Ville-Sur-Ancre, thus allowing a continuous firing line to be formed to the 15th Brigade objective. The following digitised citationRCDIG1068557–17-AWM gives a detailed account of his actions. For this William Gibb would receive the Military Cross. “For conspicuous gallantry and devotion to duty under fire. On September 3rd.1918 at PERONNE, Lieut. GIBB constructed a bridge to carry motor transport, the work being done in daylight, 1000 yards from the enemy, under direct observation, shell and machine gun fire………..……..
For this amazing feat of endurance , perseverance and bravery William Gibb was recommended for the Bar to the MC by fellow original officer and now Lieut .Colonel Mather who was also in command of the Divisional Engineers of the 5th Australian Division. William returned to Australia on board the troopship “Devon” on the 24th November 1918. In 1919 William was living at Arncliffe and continued back at his trade as plumber. In later continueing his trade as a plumber, he had travelled and was working in Japan and Canada. He married a Canadian widow with one child. They had no issue. Between the wars he became a US citizen. In 1942 he was in Honolulu when Pearl Harbour was bombed, working as an engineer plumber for the navy. Between the wars he had become an American citizen and settled at Portland, Oregon, where he died in 1960. One of his brothers had served with the New Zealand forces at Gallipoli. In March his unit embarked for Lemnos and undertook dredging, well-sinking and the construction of accommodation, roads and floating landing-stages. On 25 April he was present when his company landed with the 3rd Brigade near Ari Burnu on the Gallipoli peninsula as the covering force for the 1st Australian Division. As the Turkish resistance increased the engineers became heavily committed to offensive sapping, tunnelling and demolition of enemy trenches. Gibb was evacuated temporarily on 30 July with influenza. During the withdrawal from Gallipoli on 20 December he was a member of a rear-party responsible for tunnel patrolling and mine demolition despite his unit’s departure some weeks before. When the A.I.F. returned to Egypt the engineers moved into camp at Tel-el-Kebir and then in January 1916 the 1st Field Company again occupied a defensive position on the Suez Canal. 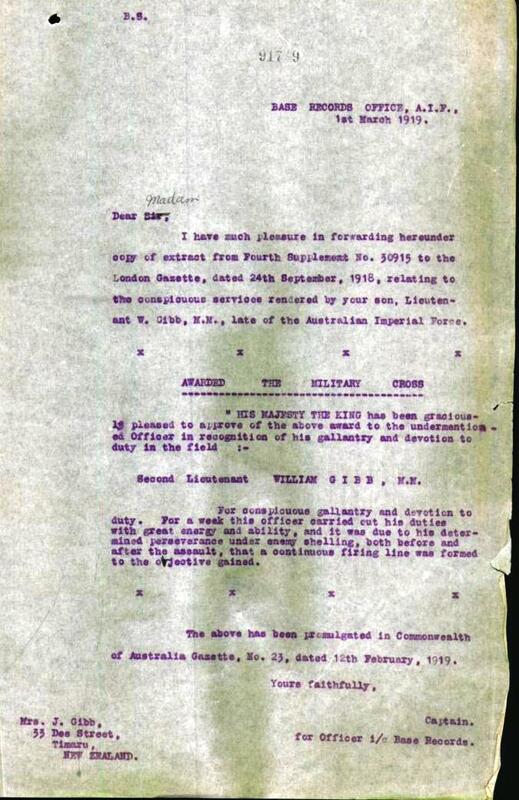 On 22 January Gibb was promoted lance corporal. With the expansion of the A.I.F. to five divisions in 1916, Gibb was transferred to the 15th Field Company, 5th Division, and promoted corporal on 25 April. In June the division moved to the Western Front in northern France and Gibbs’s company again became involved in offensive sapping under heavy fire; at Fromelles in July the division suffered over 5000 casualties. 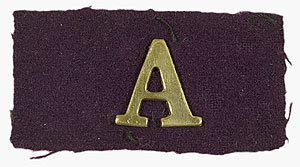 Gibb then served in the Armentières area and on 6 December was promoted sergeant. Following the German withdrawal to the Hindenburg line he participated in the Bullecourt and Messines operations in 1917 during which the engineers suffered heavy casualties. For his exemplary service in these operations he was awarded the Military Medal. On 23 February 1918 he was commissioned second lieutenant, and on 23 May promoted lieutenant. In June he was attached to the 567th Army Troops Company, Royal Engineers, which was supporting the 5th Australian Division. R. Sutton, ‘Gibb, William (1890–1960)’, Australian Dictionary of Biography, National Centre of Biography, Australian National University, http://adb.anu.edu.au/biography/gibb-william-6301/text10867, published first in hardcopy 1981, accessed online 23 February 2016. Create a free website or blog at WordPress.com. The Big Brother Theme.